Wiki Education held its second in-person board meeting for the 2017-2018 fiscal year in Tiburon. Our Senior Leadership team informed the Board of key initiatives the organization is planning to undertake in fiscal year 2018–19. Board members also discussed and approved Wiki Education’s new strategic plan, as well as the annual plan and budget for the year ahead. We announced our new three-year strategy. The strategy focuses on three strategic goals around Equity, Quality, and Reach: Increase knowledge equity by focusing on content and communities that are underrepresented on Wikipedia and Wikidata; provide people who seek knowledge online with accurate information in topic areas that are underdeveloped; and reach large audiences with free knowledge by making Wikipedia and Wikidata more complete. Read more about the strategy here. We also announced the Annual Plan for the 2018-2019 fiscal year. This year will be one of transition as we implement necessary strategic shifts to ensure our organization’s sustainability. Read more about the plan here. Several of Wiki Education’s partners committed to participate in the Wikipedia Fellows program in July and beyond, including the National Communication Association, Association for Psychological Science, Linguistic Society of America, American Chemical Society, and the Association for Women in Mathematics. It’s exciting to see such enthusiasm for another program that we believe can make a real impact! Google Summer of Code student Pratyush has brought the new Article Finder tool to a point where it’s already quite useful for instructors and students to explore topic areas and find articles on Wikipedia. The tool will help students and instructors find articles in need of development in an automated, straight-forward way. In June, several of Wiki Education’s partners committed to participate in the Wikipedia Fellows program, including the National Communication Association, Association for Psychological Science, Linguistic Society of America, American Chemical Society, and the Association for Women in Mathematics. Several of their members will join Wikipedia Fellows cohorts in July and beyond. 400 Wiki Education-supported courses were in progress (220, or 55%, were led by returning instructors). 8,336 student editors were enrolled. 56% of students were up-to-date with their training. Students edited 8,910 articles, created 709 new entries, and added 6.71 million words. The Spring 2018 term is officially over, and we’re already gearing up for the Fall! Though June was a pretty quiet month for student editing, Wikipedia Content Experts Ian Ramjohn and Shalor Toncray were busy combing through courses and closing them out on our end. Classroom Program Manager Helaine Blumenthal has begun perusing our instructor survey and planning for the Fall term. The summer is an opportune time for the Classroom Program team to reflect on the previous term. While we’ve supported thousands of students and courses for almost a decade, we’re continually learning how to improve our students’ and instructors’ experiences. While it often takes several terms to implement changes, the summer is when many of these innovations take shape. We’re also looking forward to seeing the great work that our Summer 2018 students do. Although the Incredibles 2 shows plenty of heroes wearing spandex and costumes, the saying still stands that not all heroes wear a costume, as students in Kirstyn Leuner’s Literacy and Social Justice class can attest. One such hero is Jean Childs Young, an educator and Civil Rights Movement advocate who fought for equal access to education in the United States, children’s rights, voter rights, and access to voter registration for African Americans. Prior to this course, Young lacked an article on Wikipedia, but thanks to one hardworking student, this has been rectified. Together with her husband and fellow activist Andrew Young, Young organized a voter registration rally in Thomasville, Georgia, despite facing hostile resistance from the Ku Klux Klan. Her tireless work was also a deciding factor in her being named the chair of the American committee of the UN International Year of the Child in 1978 by President Jimmy Carter. When she died in 1994 Young’s funeral was well attended and the tributes to her included a poem read by Maya Angelou, a eulogy spoken by Coretta Scott King, and a personal note from President Bill Clinton. This was not the only stellar contribution by students in the Santa Clara University course. One student noticed that there was no independent article on violence against women in Mexico, only a subsection in the main article on women in Mexico. Aware that this is a major topic in any country, the student set about creating a page that now contains a better overview of the topic than was previously on Wikipedia. The value of a good education cannot be emphasized enough, but unfortunately access to higher education remains closed to many. The 2001 California Assembly Bill 540 is intended to help reduce the barrier to access by allowing access to in-state tuition rates for undocumented and other eligible students at California’s public colleges and universities. This greatly benefits undocumented students, as they face additional obstacles such as higher rates of poverty, lack of government-sponsored financial assistance, and social marginalization. Thanks to a University of California, Santa Cruz student in Elizabeth Beaumont’s Constitutional Meanings and Movements class, the article for this Bill has now been updated and revised to give readers clearer and more up-to-date information. Students in Peter Clift’s Basin Studies class created articles on three of the world’s sedimentary basins — the Grenada Basin, located in the southeastern Caribbean, the Lusitanian Basin, located both onshore and offshore in western Portugal, and the Nam Con Son Basin located southeast of Vietnam. Another student expanded the Wessex Basin article, which prior to the expansion was just a three-sentence stub. Over the years, various iterations of this class have created or expanded articles on a number of these basins, narrowing a gap in this area of geology. Other classes were also active in the field of geology. The meeting of two plates of the Earth’s crust is a geologically active zone. If one plate is pushed under the other, a process known as subduction, the mixture of melting rock and water can create an active volcanic zone. The Aleutian subduction zone, where the Pacific plate is pushed under the North American plate, is responsible for the Aleutian arc of volcanoes. A student in William Wilcock’s Marine Geology and Geophysics class created the Aleutian subduction zone article. A satellite galaxy is a small galaxy that orbits a larger host galaxy, held in orbit by its gravitational potential. A student in Aaron Barth’s course, Galactic Astrophysics, converted the existing short, incomplete article into a far more substantial article which improved both rigor and readability. Other students in the class expanded a range of articles including metallicity, stellar kinematics and Lutz–Kelker bias. In biodiversity studies, there’s a lingering question of how many more species you might have recorded if you have kept searching. The question of how many species you missed is known as the unseen species problem. A student in Daniel Lewis’ Humanistic Ecology class created an article about the techniques used to answer this problem (which have also been applied to the question of how many words William Shakespeare knew). Eurytherms are organisms which can function at a wide range of environmental temperatures. Desert pupfish, for example, can function in environments that range from 8º C to 42° C. A student in the class expanded Wikipedia’s very short eurytherm article, making it much more complete. Another student took the short article on functional ecology and greatly expanded it. Other articles improved by students in the class improved the article about the documentary After Winter, Spring, the disaster tourism article and the Māori and conservation article. Finding and adding good images to Wikimedia Commons can be difficult at times for students, however these two students in Sheila Afnan-Manns’s course at Paradise Valley Community College found some good material to add. One student added an image of an adorable husky puppy, while another edited an existing Commons image of the Frankfurt Zoological Garden in order to make the building the sole focus of the image. The bottom third of the original image was dominated by the road in front of the building. Image: File:Zoo23.jpg, Glieten, CC BY-SA 3.0, via Wikimedia Commons. 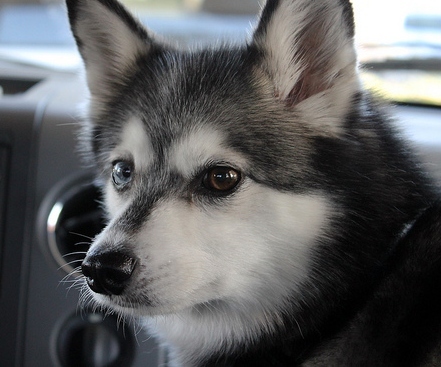 Image: File:Pup in car (1).jpg, rabiem22, CC BY 2.0, via Wikimedia Commons. Jean Philippe has begun his appointment at Rutgers University. UNM and NDSU are still pending. 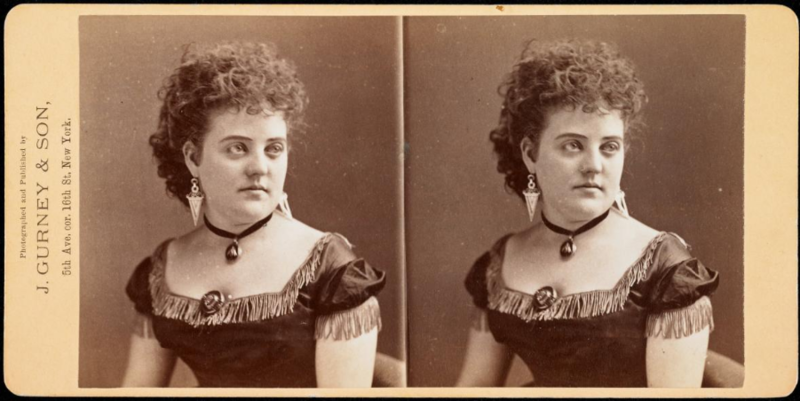 Image: File:Jennie Kimball (1669-74).png, public domain, via Wikimedia Commons. 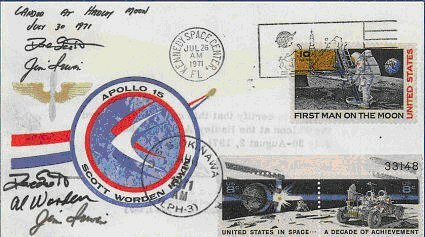 Sieger cover Uploaded by User:Wehwalt. Image: File:Sieger cover.jpg, public domain, via Wikimedia Commons. Eryk continued his work on the Algorithmic Bias article. There are currently 33 participants in Wikipedia Fellows. We are a few weeks in and things are coming along nicely. All participants are on the Dashboard, attendance in our sessions has been strong and we are looking forward to the first wave of contributions a the end of July. These three cohorts are unique in that they will last four months instead of three. These cohorts are also unique in that there are two themed cohorts – both of which are contributing to articles associated with the US Midterm Elections in November 2018. These cohorts have participants representing the NWSA, ASA, and MPSA. The second week of July we will be starting three new cohorts. These cohorts will last three months and follow a similar pattern to our June-Start cohorts. They will differ in size, theme, and association composition. We are accepting applications from the NWSA, ASA, MPSA, APS, ACS, AWM, and the LSA. At this time we are planning two more cohorts in August and one more in September. Individuals who applied to this round will be considered for future cohorts in an effort to have a smooth placing, scheduling, and cultivation process. We made several announcements this month, the most important of which were the announcements of our new three-year strategy and the Annual Plan for the 2018-2019 fiscal year. We also announced the new print resources available for students editing Wikipedia in cultural anthropology and LGBT+ studies courses. We often feature perspectives of instructors on our blog, who share their tips and tricks for teaching with Wikipedia. Instructor willingness to engage in this way speaks to the enthusiasm our Classroom Program generates. This month, Maikel Alendy writes why he’ll teach his online students to edit Wikipedia in every future course. A few Wikipedia Fellows from our pilot cohort also lent their voices to our blog this month. Dr. Niki Kalaf-Hughes shares three things she learned from participating in the pilot and Michelle Gohr speaks to the opportunity that academics have to disrupt traditional forms of knowledge production by learning to improve Wikipedia. We also featured reflections by Visiting Scholars about why they participate in our program. Dr. Jackie Koerner speaks to the importance of sharing knowledge freely, citing the Paul K. Longmore Institute on Disability as a helpful part of that mission. And Eryk Salvaggio writes about creating the article about algorithmic bias and his hope for its effect on mainstream culture and knowledge. Our two summer internship projects made considerable progress this month, with Urvashi and Pratyush each conducting user research and delivering a series of improvements that are live on the Dashboard. Urvashi has been focusing on the Uploads tab of course pages, which is now much more flexible and useful, and we have ideas for including more actionable information in the uploads layout soon. Pratyush has brought the Article Finder to a point where it’s already quite useful for instructors and students to explore topic areas and find articles on Wikipedia, and user tests in late June gave us a clear picture of where to focus next. We also added two new email features to the Wiki Education Dashboard this month: reminder emails to students who have not completed their assigned training modules, and automatic follow-up emails for instructors after their courses have been approved, to share additional resources that answer the most common questions instructors have at the early stages of a Wikipedia assignment. For the global Wikimedia Programs & Events Dashboard, we enabled automated Wikipedia edits for courses on Czech Wikipedia — the second community after Portuguese Wikipedia to request turning this feature on. Product Manager Sage Ross created a web version of our new Wiki Education Strategy for 2018-21, and also presented an overview of the Dashboard for the AgileVenture remote conference. 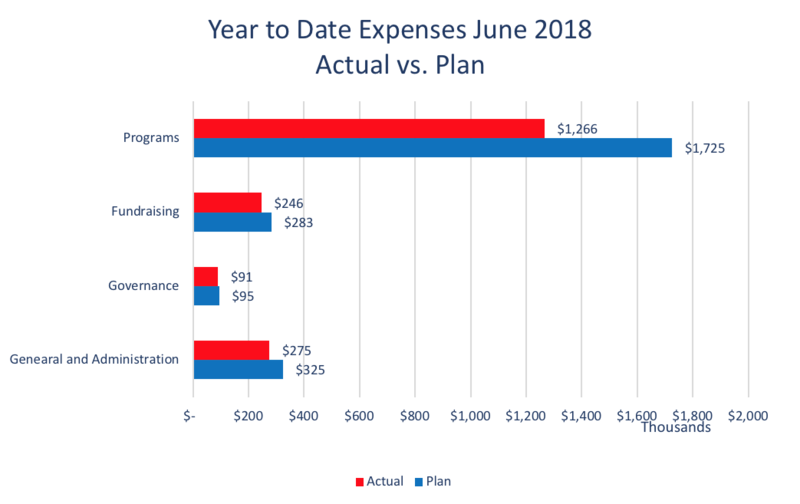 For the month of June, the total expenses were $170,000, ($61K) less than the budget of $231,000. As expected, Programs is under budget by ($58K). As has been the trend for some time, where there was a reduction in staff leading to the budget reduction of ($34K) in payroll, ($11K) in Professional Services, ($10K) in travel and ($3K) in associated occupancy expenses. The remaining $3k under budget is due to the Board underspending in the month of June. Wiki Education expenses for the month of June 2018. The year-to-date expenses of $1,878,000 were under the budgeted amount of $2,428,000 by ($550,000). Governance dipped to $5K under budget YTD due to this month’s under spending. As expected, Programs is the most under budget due to changes in budgeted personnel ($217K), Professional Services ($155K), Travel ($45K), Associated marketing costs ($9K), administrative costs ($13K) and indirect costs associated with a lowered occupancy ($20K). 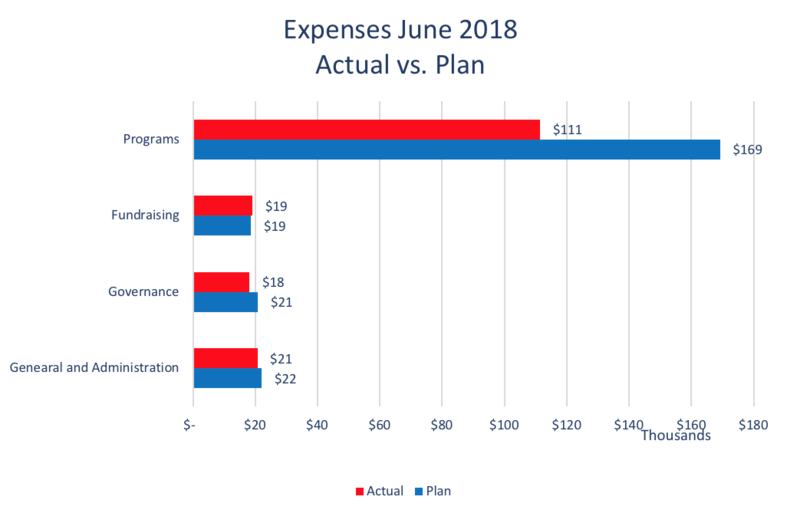 Fundraising is under budget ($36K) YTD due to a shortage in Travel in December/ January and a conference in May that was budgeted and not attended. General and Administrative has been under budget due to Personnel changes at the end of Q2 and replaced with outsourced support. This is a known reduction and is under budget YTD by ($49K). Wiki Education expenses by area, year to date as of month of June 2018. In June, Wiki Education received two major grants: a $100,000 grant from the Heising-Simons Foundation and a $50,000 grant from the William and Flora Hewlett Foundation. The grant from the Heising-Simons Foundation will provide general program support to our Communicating Science efforts. The grant from the Hewlett Foundation is restricted to supporting capacity building activities. We will use this money toward the development of a viable business model over the next several months. In addition to these two grants, we were formally invited by a major foundation to submit a grant proposal to support our Communicating Science work. We expect this grant, if approved, to be awarded in late July or early August. Finally, Director of Development and Strategy TJ Bliss provided an update on our business model development to the Wiki Education Board during the June board meeting. The month of June is traditionally the time for the second in-person meeting of our Board. This time, the meeting took place in the small town of Tiburon, a 30-minutes drive from our office in the Presidio. During the first day, our Senior Leadership team informed the Board about key initiatives the organization is planning to undertake in fiscal year 2018–19. On the second day, Board members discussed and approved Wiki Education’s new strategic plan, as well as the annual plan and budget for the year ahead. Then, Board and Senior Leadership took the opportunity to connect with Dr. Jenn Brandt, Department Chair for Women’s Studies at High Point University, and learn from her experiences as a participant in our new Fellows Program in Spring 2018. Jenn had significantly expanded and reorganized the article about award-winning author Margaret Atwood while also using Wikipedia as a pedagogical tool in the classroom. In the afternoon of the second day, the Board meeting concluded with updates from the Board committees and an executive session. Feedback from the Board members on the new and shorter meeting schedule was overwhelmingly positive, which means that we’ll continue on this path in the future. 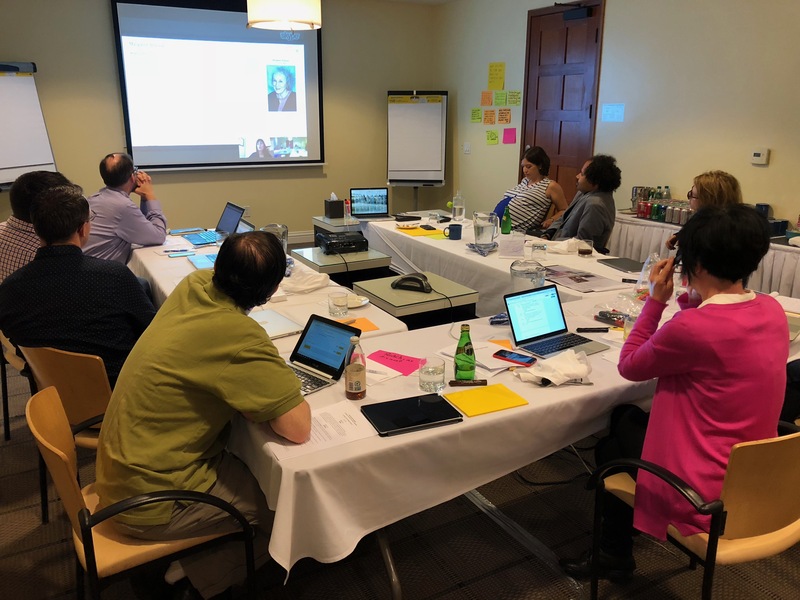 Board and senior staff engage in a video conference with Jenn Brandt, department chair for women’s studies at High Point University, during the in-person board meeting in Tiburon. Also in June, Executive Director Frank Schulenburg worked on performance reviews for his direct reports. After discussions among the group of managers at our organization, we decided to stick to the existing model of annual reviews, while also keeping the weekly time between managers and their direct reports as an important opportunity to check in on work progress and potential roadblocks. Frank and HR Associate and Executive Assistant Ozge Gundogdu continued their work looking for alternative service providers in the fields of HR and banking, leading to the opening of a new bank account that will enable us to be more efficient in scheduling payments and in handling donations. We also met with different representatives from PEO services in order to get a better picture of whether a switch from our current PEO would improve the smoothness of operations, while keeping our current benefit system on the same level. On June 26, TJ and Frank met with Kim Thanos, ED of Lumen Learning, in Las Vegas in order to learn more about how Lumen managed to add earned income to the organization’s revenue stream. This conversation kicked-off a process in which Wiki Education will explore ways to move from a free-of-charge model to a pay-for-services model in select program areas. Based on the observation that our revenue through philanthropic donations cannot keep pace with the growth in demand for our programmatic offerings, we’ll be working over the next couple of months on adapting our revenue model with the goal of achieving a higher level of financial sustainability for our organization.